Saint Aloysius Gonzaga is one of Holy Mother Church's shining examples of a youth who maintained his innocence and purity throughout his twenty-three years of life as a member of the Church Militant on earth. I have had a particular devotion to this great lover of Our Blessed Lord and Saviour Jesus Christ in His Real Presence since 1956, the year I entered kindergarten at the school in the parish that had taken him for its patron in Great Neck, Long Island, New York. I owe Saint Aloysius Gonzaga so very much, for it was in the school that bore his name that I learned my Catholic Faith without any degree of compromise or dilution, It was in Saint Aloysius Church that I made my First Holy Communion on Saturday, May 30, 1959, and it was in that same church that the Most Reverend Walter P. Kellenberg, the founding Bishop of the Diocese of Rockville Centre, confirmed me as a soldier in the Army of Christ when I received the Sacrament of Confirmation on March 21, 1961. Oh, yes, I owe Saint Aloysius so very much. Saint Aloysius Gonzaga was born in 1568. He received his own First Holy Communion from the hands of Saint Charles Borromeo, then a curial cardinal who was doing theological battle with the forces of the Protestant Revolt. Saint Aloysius had from the start a pure and burning love for Our Lord in His Real Presence in the Most Blessed Sacrament. Indeed, it is said that he had such burning fervor for Our Lord when receiving Holy Communion that his whole chest was aflame with a palpable, burning ardor. He was so aflame with ardor that he had to burst out of the doors of the church frequently after the reception of Holy Communion and throw himself into the fountain in the piazza in order to cool off his ardor. "O God, among the gifts of heaven bestowed upon the angelic youth, Aloysius, you united a wondrous innocence to his exceptional spirit of penance. Although we have not followed his path of innocence, may we at least imitate his penance through his own merits and prayers." Saint Aloysius spent much time in prayer before the Blessed Sacrament, understanding that Eucharistic piety was a true foretaste of eternal glories. His time in prayer before the Blessed Sacrament prepared him to see in others the very image and likeness of the One he loved with such innocence and purity. It was this pure love of Our Lord that moved him to reject the courtly privileges of the Gonzaga family and to join the Society of Jesus when he was seventeen years of age. He excelled in his theological studies, excelling even more in his service to the poor and the the forgotten, especially the little waifs of the Trastevere district in Rome to whom he taught and explained the basics of the catechism. It was his desire to serve the Christ in the poor and the sick and the suffering that brought him to the bedside of a patient who was dying from the plague, thereby exposing himself to the disease that killed him in short order. Saint Aloysius did not fear exposing his mortal body to the dangers of a man dying from the plague. He understood that suffering and physical death, both of which are punishments for Original Sin, are not the most dangerous things for a human being. Exposure to the near occasions of sin was what could result in the eternal death of the soul. Far better to be exposed to the diseases of mortal flesh than to contaminate both body and soul by a lukewarmness of spirit and/or by the casual embrace of sin and sinful influences in the course of one's daily life. Saint Aloysius teaches us to recognize that our souls must be kept free from the contagion of sin and error lest we die of the spiritual plagues of pride, lust, envy, gluttony, anger, sloth and greed and their permutations. His confessor, Saint Robert Bellarmine, believed that it was most certainly the case that Saint Aloysius had never committed a Mortal Sin in his entire life. It is possible for one to cooperate with the graces won for the many on the wood of the Holy Cross by the shedding of every single drop of the Divine Redeemer's Most Precious Blood to scale the heights of personal sanctity so that he can gain he highest place in Heaven next to that of the Blessed Mother herself. Saint Aloysius had four great devotions in his daily life: the first was, as mentioned before, to Our Lord in His Real Presence in the Most Blessed Sacrament. The second of Saint Aloysius' great devotions was to the Passion of Our Lord. He united all of his very intense sufferings to Our Lord's Passion as he was dying from the effects of the plague. He wanted to conform his life to the standard of the Holy Cross at every moment of his existence. The third of Saint Aloysius's great devotions was to the Blessed Virgin Mary, of whom he never ceased to think or to plead for her motherly intercession. Finally, the fourth great devotion of this most pure Jesuit saint was to the angels, whose glories he celebrated in what is believed to be the only writing of his that has survived him. Even though he practiced these devotions with purity and fervor of spirit, Saint Aloysius asked Saint Robert Bellarmine if it was possible for a soul to go directly to Heaven without having to suffer in Purgatory. Saint Robert Bellarmine said that it was possible, thus inspiring Saint Aloysius to pray ceaselessly as he was dying from the plague, a malady that took his life around midnight at the end of the Octave Day of Corpus Christi, June 21, 1591. His confessors testified that Saint Aloysius Gonzaga was so pure that he never committed a Mortal Sin, although he did, as a little boy, repeat indecent words whose meaning was unknown to him at a time his father sent him to live in the barracks with members of the military, hoping that his young son would be inspired to such a career. When the Marquis left with the troops for Tunis, he sent Aloysius back to Castiglione. There the Saint led the sort of life he had learned at Casale. While among the soldiers he had often heard free and improper expressions, barrack talk, and these he began to use without knowing their meaning. This he told F. Jerome Piatti (Platus), when at his request, Aloysius related to him all his life in the world. His tutor, Peter Francis del Turco, overheard him one day, and reproved him severely for this habit, and as the tutor himself asserted the Saint was never again known in all his life to utter a word that was not proper and decent. And if he heard anyone make use of such words, he either modestly cast his eyes to the ground, or turned them in another direction, pretending not to hear; or sometimes showed his displeasure. From this we may be sure that, had he known the meaning of what he said, he would never have used such words. The greatest fault that is found in the life of S. Aloysius were these words, spoken in childish ignorance. For when told that they were bad, and unfit for one in his rank and position, the Saint at once became so ashamed of them, as he himself afterwards relates, that he could not bring himself to repeat them even to his Confessor. Nay more, he regretted them all his life as though he had committed a grievous sin. As he had no worse fault to repent of, he used for his mortification and shame, when he became a religious, to relate this incident to some of his intimate friends to show that he had been bad from early childhood. And we may believe that God, by a singular providence, allowed this blot in him, who was afterwards to be enriched with so many supernatural gifts and virtues, that he might have a subject of humiliation, by seeing a fault, where, in fact, from want of age and of knowledge there was no fault, so that, as S. Gregory wrote of S. Benedict, the might draw back his foot, which he had almost begun to plant in the world. This is quite a contrast to the vulgarity of world leaders today, a phenomenon that I mentioned once again a few days ago in Sober Up, part thirteen, and to the nonplussed reaction to it on the part of many believing Catholics, who shrug their shoulders or just dismiss it indifferently. Coarseness and vulgarity offend God and hurt souls. No one is “authentic” when giving vent, whether privately or especially publicly, to that which is indecent, profane, vulgar and/or impure. Harm is done to those who speak in such manner, and the bad example given provides encouragement to others to forget any notion of modesty and self-restraint that used to govern public discourse even among common folk in a era within my own lifetime that might as well be centuries ago. "The venerable Father Caesar Franciotti," these are the words of Father Massimilian Deza in his life, being a fellow student of that angel in the flesh, S. Aloysius Gonzaga, speaks of him as a high example of the angelical virtue, holy modesty, and in one of his letters gives this high estimate of him. I saw that holy young man on his way to the lecture, going by with the others to his place, modest but cheerful, recollected but gay, humble but pleasant, bashful but serene and tranquil." In going to and returning from the schools, and during the lecture, a wonderful modesty and composure were visible in him, so that many of the scholars would stay in the court yard of the college to see him pass by and were greatly edified. A foreign abbot who had finished his course of theology in the Roman College, attracted by his modesty, continued to go there merely to see him, and never took his eyes off him during the lecture. As it was usual in winter, to put one’s arms into the sleeves of the soprana, he asked a companion if it were allowed to go to the lecture at the schools in that way, or whether he thought it might give scandal. When he was assured it would not, he generally wore the soprana in that fashion. All this is not surprising, for as Father Bernardine Rossignoli, the provincial of Venice, deposed in the process instituted by the Patriarch of Venice, there seemed to be verified in him those words of S. Ambrose on the verse in the psalm: Qui timent te, videbunt me et laetabuntur^ They who fear Thee, O my God, shall see me walking in the way of Thy command ments and shall rejoice thereat. "The sight of a just man is precious; for to the greater number of people it serves as a warning to correct, while to the more perfect it brings gladness." F. Rossignoli went on to say, that the sight of this holy young man had just the same effect on those who saw him, so that there were verified in him these words: "The countenance of the just man heals, and the glances of the eyes of the just man seem to in fuse a certain virtue into those who faithfully desire to see him." Four hundred twenty-seven years have passed since the death of Saint Aloysius Gonzaga. The brightness of his love for Our Lord in His Real Presence still illumines the path of those First Communicants, who are given Saint Aloysius as an example to imitate as they prepare to receive Our Lord for the first time in Holy Communion. How fitting it is that both Pope Benedict XIII and Pope Pius XI declared Saint Aloysius Gonzaga, S.J., the patron of youth. You see, all we need to do to turn back the plagues of sin and sinful influences that seek to besmirch and ensnare the young today is to teach them about saints such as Saint Aloysius Gonzaga and Saint Therese Lisieux and Saint Dominic Savio and Saint John Berchmans and Saint Stanislaus Kostka. There is no need at all for the evil of various "instruction programs" as to how to avoid sins of impurity. All a young Catholic needs is the good example of Saint Aloysius and Saint Therese and Saint Dominic Savio to prompt him or her to reject sin and to cooperate more fervently with the God's grace as a consecrated slave of Our Lady's Sorrowful and Immaculate Heart. Although there are some, yes, even in fully traditional circles, who believe students do not have to pursue excellence as befits redeemed creatures, that they can be content with "average" efforts and live lives content with mediocrity as they overindulge in sporting activities and other recreations, Saint Aloysius teaches us to work hard at the pursuit of excellence in our studies no matter our abilities. We work hard as befits redeemed creatures to please God, Who has not created us to live "average" or "mediocre" lives. Although we are given different intellectual gifts, God expects each one of us to give Him our very best efforts, especially as we seek to sanctify our immortal souls as members of His true Church and as we endeavor to root out vice and sin from even our thoughts, no less our words and deeds, withdrawing more and more from the world and from a spirit of worldliness. The innocence and purity of Saint Aloysius Gonzaga teaches us to love God--Father, Son and Holy Ghost--with hearts that have been purified in the Baptismal font and regenerated again and again in the Sacred Tribunal of Penance, strengthened in love for God, Who is Love, by acts of voluntary mortification and penance, by lives of profound Eucharistic piety and deep, tender devotion to the Mother of God. Again, it is by Mary Magdalene de Pazzi, the depository of the secrets of the Spouse, that this mystery is revealed to us. In the rapture during which the glory of Aloysius was thus displayed before her eyes, she thus continues, while still under the influence of the Holy Ghost: 'Who could ever explain the value and the power of interior acts? The glory of Aloysius is so great simply because he acted thus interiorly. Between an interior act and that which is seen, there is no comparison possible. Aloysius, as long as he dwelt on earth, kept his eye attentively fixed on the Word; and this is just why he is so splendid. Aloysius was a hidden martyr; whosoever love thee, my God, knoweth thee to be so great, so infinitely lovable, that keen indeed is the martyrdom of such a one, to see clearly that he loves thee not so much as he desireth to love thee, and that thou art not loved by thy creatures, but art offended! . . . Thus he became a martyrdom unto himself. Oh! did love while on earth! Wherefore now in heaven he possesses God in a sovereign plenitude of love. While still mortal, he discharged his bow at he heart of the Word; and now that he is heaven, his arrows are all lodged in his own heart. For this communication of the Divinity, which he merited by the arrows of his act of love and of union with God, he now verily and indeed possesses and clasps for ever'. To love God, to allow his grace to turn our heart towards infinite Beauty, which allow can fill it, such is then the true secret of highest perfection. Who can fail to see how this teaching of to-day's feast answers to the end pursued by the Holy Ghost ever since his coming down at our glorious Pentecost? This sweet and silent teaching was given by Aloysius, wheresoever he turned his steps, during his short career. Born to heaven, in holy Baptism, almost before he was born to earth, he was a very angel from his cradle; grace seemed to gush from him into those who bore him their arms, filling them with heavenly sentiments. At four years of age he followed the marquis his father into the camps; and thus some unconscious faults, which had not so much as tarnished his innocence, became for the rest of his life the object of a penitence that one would have thought beseemed some grievous sinner. He was but nine years old when, being taken to Florence, there to be perfected in the Italian language, he became the edification of the court of duke Francis: but though the most brilliant in Italy, it failed to have any attraction for him, and rather served to detach him more decisively than ever from the world. During this period, likewise, at the feet of the miraculous picture of the Annunziata, he consecrated his virginity to our Lady. May we always instruct our children to be likewise diligent in their studies for love of God, never content with mediocrity or sloth at any time for any reason whatsoever. It takes hard work to get home to Heaven, and we are to work hard in our state-in-life, yes, even if we are children. Playtime is wonderful. We are not made by God to play all of the time, worse yet to be possessed of the Americanist spirit of anti-intellectualism that loathes study as being somehow an "interference" with "fun stuff." This is the path to Hell, not Heaven. Saint Aloysius shows us how to get to Heaven! Where do you want your children to go? Aloysius, eldest son of Ferdinand Gonzaga, Marquess of Castiglione, was so hurriedly baptized on account of danger that he seemed to be born to heaven almost before he was born to earth, and he so faithfully kept that his first grace that he seemed to have been confirmed therein. From his first use of reason, which he employed to offer himself to God, he led a life more holy day by day. At Florence, when he was nine years old, he made a vow of perpetual virginity before the Altar of the Blessed Virgin, upon whom he always looked as in the place of a mother to him, and by a remarkable mercy, from God, he kept this vow wholly and without the slightest impure temptation, either of mind or body, during his whole life. As for any other uprisings of the soul, he began at that age to check them so sternly, that he was never more pricked by even their earliest movements. His senses, and especially, his eye-sight, he so mortified, that he never once looked upon the face of Mary of Austria, whom, when he was for several years one of the Pages of honour of the King of Spain, he saluted almost every day and he even denied himself in part, the pleasure of looking on the face of his own mother. He might indeed have been justly called a fleshless man, or an infleshed angel. With this fettering of the senses he added torture of the body. He kept three days as fasts in every week, and that mostly upon a little bread and water. But indeed he as it were fasted every day, for he hardly ever took so much as an ounce weight of food at breakfast. Often also, even thrice in one day, he would lash himself to flowing of blood with cords, or prick himself with spiked chains. He sometimes used a dog-whip, instead of a scourge, and the rowels of spurs instead of hair-cloth. He privately filled his soft bed with pieces of broken plates, that he might find it easier to wake to pray. He passed great part of the night, clad only in a shirt even in the depth of winter, kneeling on the ground, or lying flat on his face when too weak and weary to remain upright, busied with heavenly thoughts. Sometimes he would keep himself thus for three, four, or five hours, until he had spent at least one without any movement of body or any wandering of mind. Such perseverance obtained for him the reward of being able to keep his understanding quite concentrated in prayer without distraction, as though rapt in God in an unbroken extasy. Desiring to give himself up to Him alone, he overcame, after a strong opposition for three years, the objections of his father, procured the transfer to his brother of his right to the Marquessate, and on the 25th of November, 1585, joined at Rome the Society of Jesus, to which he had been called by a voice from heaven when he was at Madrid. The angelic life of Saint Aloysisus Gonzaga is both a contrast and a rebuke to the filthy, impure lay Jesuit, Jorge Mario Bergoglio, who revels in all things having to do with indecency and impurity in the name of "mercy" as he justifies the impure in their sins, especially if they have achieved a "noteworthy stability" in the life of sins against Holy Purity (see Jorge Mario Bergoglio: A Man of Sin). Bergoglio would probably appoint an "apostolic visitator" to investigate how the Society of Jesus could admit a man into its ranks who engaged in what he believes are "masochistic" acts of mortification. "In the history of the Church there have been some mistakes made on the path towards God. Some have believed that the Living God, the God of Christians can be found on the path of meditation, indeed that we can reach higher through meditation. That's dangerous! How many are lost on that path, never to return. Yes perhaps they arrive at knowledge of God, but not of Jesus Christ, Son of God, the second Person of the Trinity. They do not arrive at that. It is the path of the Gnostics, no? They are good, they work, but it is not the right path. It’s very complicated and does not lead to a safe harbor. " In other words, Saint Aloysius did not arrive “at the Living God, Jesus Christ,” because he was a “pelagian” who believed that he could “arrive by” his own “efforts.” This is another correlative proof of the sort of vile apostate posing as the Vicar of Christ, a man who believes himself to be a reliable spiritual guide and role model for Catholics worldwide. Anyone who does not see the contrast between Saint Aloysius and the lay Jesuit from Argentina is willfully blind. "Venerable old age is not that of long time, nor counted by the number of years: but the understanding of man is grey hairs; and a spotless life is old age." (Wisdom 4: 8-9) And therefore, Aloysius, thou dost hold a place of honour amidst the ancients of they people! Glory be to the holy Society in the midst whereof thou didst, in so short a space, fulfill a long course; obtain that she may ever continue to treasure, both for herself and others, the teaching that flows that thy life of innocence and love. Holiness is the one only thing, when life is ended, that can be called a true gain; and holiness is acquired from within. External works count with God, only in as far as the interior breath that inspires them is pure; if occasion for exercising works be wanting, man can easily always supply the deficiency by drawing nigh unto the Lord, in the secrecy of his soul, as much as, and even more than, he could have done by their means. Thus didst thou see and understand the question; and therefore prayer, which held thee absorbed in its ineffable delights, succeeded in making thee equal to the very martyrs. What a priceless treasure was prayer in thine eyes, what a heaven-lent boon, and one that is indeed in our reach, too, just as it was in thine! But in order to find therein, as thou didst express it, 'the short cut to perfection,' perseverance is needed and a careful elimination from the soul, by a generous self-repression, of every emotion which is not of God. For how could muddy or troubled waters mirror forth the image of him who stands on their brink? Even so, a soul that is sullied, or a soul that without being quite a slave of passion is not yet mistress of every earthly perturbation, can never reach the object of prayer, which is to reproduced within her the tranquil image of her God. The reproduction of the one great model was perfect in thee; and hence it can be seen how nature (as regards what she has of good), far from losing or suffering aught, rather gains by this process of recasting in the divine crucible. Even in what touches the most legitimate affections, thou didst look at things no loner form the earthly point of view; but beholding all in God, far were the things of sense transcended, with all their deceptive feebleness, and wondrously did thy love grow in consequence! For instance, what could be more touching than thy sweet attentions, not only upon earth, but even from thy throne in heaven, for that admirable woman given thee by our Lord to be thine earthly mother? Where may tenderness be found equal to the affection effusions written to her by thee in that letter of a saint to the mother of a saint, which thou didst address to her shortly before quitting thine earthly pilgrimage? And still more, what exquisite delicacy thou didst evince, in making her the recipient of thy first miracle, worked after thine entrance into glory! Furthermore, the Holy Ghost, by setting thee on fire with the flame of divine charity, developed also within thee immense love for thy neighbour: necessarily so because charity is essentially one; and well was this proved when thou wast seen sacrificing thy life so blithely for the sock and the plague-stricken. We should pray, therefore, to Saint Aloysius not only on his feast day, June 21, but every day so that those of us who may have been been impure in thought, word and deed in the past might become serious about the pursuit of holiness and embrace with joy the cross of penance and humiliation as the true pathway to making our souls as white as they were when we wore white suits and white ties and white shoes and white socks and white shirts (or white dresses and white veils) at the time we received our First Holy Communion. May Saint Aloysius, a pure lover of the Eucharist, help us to spend many hidden hours in prayer before the tabernacle, keeping company with Our Lady and all of the angels and saints, including Saint Aloysius himself, as we pray as many Rosaries each day as our states-in-life permit. To thy will and that of thy divine Son. Saint Aloysius Gonzaga, S.J., pray for us. God, the Holy Ghost, the Sanctifier, Have mercy on us. Saint Aloysius Gonzaga, Pray for us. Beloved child of Christ, Pray for us. Delight of the Blessed Virgin, Pray for us. Most chaste youth, Pray for us. Angelic youth, Pray for us. Most humble youth, Pray for us. Model of young students, Pray for us. Despiser of riches, Pray for us. Enemy of vanities, Pray for us. Scorner of honors, Pray for us. Honor of princes, Pray for us. Jewel of the nobility, Pray for us. Flower of innocence, Pray for us. Ornament of a religious state, Pray for us. Mirror of mortification, Pray for us. Mirror of perfect obedience, Pray for us. Lover of evangelical poverty, Pray for us. Most affectionately devout, Pray for us. Most zealous observer of rules, Pray for us. Desirous of the salvation of souls, Pray for us. Perpetual adorer of the Holy Eucharist, Pray for us. Particular client of Saint Ignatius, Pray for us. Be merciful: Spare us, O Lord. Be merciful: Hear us, O Lord. From the concupiscence of the eyes: O Lord, deliver us. From the concupiscence of the flesh: O Lord, deliver us. From the pride of life: O Lord, deliver us. Through the merits and intercessions of St. Aloysius: O Lord, deliver us. Through his angelic purity: O Lord, deliver us. Through his sanctity and glory: O Lord, deliver us. Lamb of God, Who takest away the sins of the world: Spare us, O Lord. Lamb of God, Who takest away the sins of the world: Graciously hear us, O Lord. Lamb of God, Who takest away the sins of the world: Have mercy on us. O Blessed Aloysius! adorned with Angelic graces, I, thy most unworthy servant, recommend especially to thee the chastity of my soul and body, praying thee, by thy angelic purity, to plead for me with Jesus Christ the Immaculate Lamb, and His most holy Mother, Virgin of virgins, that they would vouchsafe to keep me from all grievous sin. O never let me be defiled with any stain against my chastity; but when thou dost see me in temptation, or in danger of falling, then remove far from me all bad thoughts and wicked desires; and awaken in me the memory of an eternity to come, and of Jesus crucified. Impress deeply in my heart a sense of the holy fear of God, and thus kindling in me the fire of thy divine love, enable me so to follow thy footsteps here on earth, that in heaven with thee, I may be made worthy to enjoy the sight of our God forever. Through Our Lord Jesus Christ. Amen. Pray one Our Father, Hail Mary and Glory be. 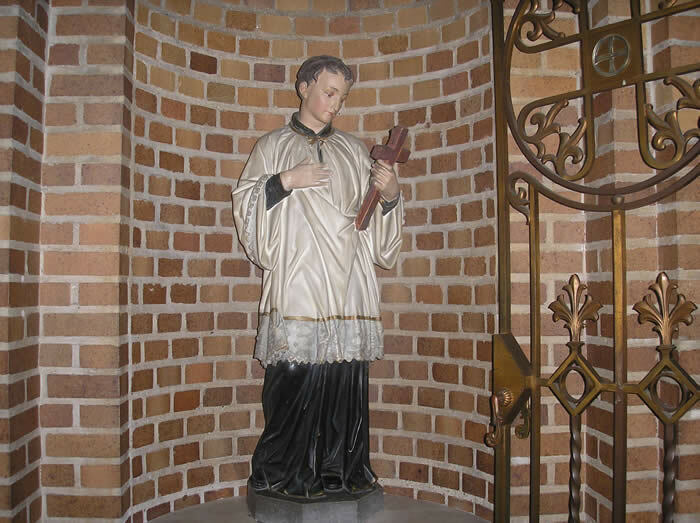 Statue of Saint Aloysius Gonzaga, Vestibule of Saint Aloysius Church, Great Neck, New York, Saturday, November 24, 2007. Pontius Meropius Anicius Paulinus was born of a most illustrious family of Roman citizens at Bordeaux, in Aquitaine, in the year of restored salvation 353, and was of keen intelligence and graceful manners. With Ausonius as his master, he was honourably distinguished for eloquence and poetry. Being of the higher nobility, and very wealthy, he began a career of honours in the flower of his youth, and attained senatorial dignity. Then he went to Italy as consul, where he obtained the province of Campánia and fixed his residence at Nola. here he was struck, as by a ray of the divine light, by the heavenly miracles which were making illustrious the tomb of Felix, Priest and Martyr, and began to adhere more earnestly to the true faith of Christ, which he had long been revolving in his mind. And so he resigned the consular fasces and axe, never defiled by blood, and returned to Gaul, and after suffering various hardships and many toils both by land and by sea he received an injury to the eye; but being restored to health by the blessed Martin, Bishop of Tours, he was washed in the lustral waters of baptism by the blessed Delphinus, Bishop of Bordeaux. He despised his abundant wealth, sold his property, and gave the money to the poor, and left his wife Therasia, changed his country, broke all natural ties, and retired to Spain, conforming to the more precious poverty of Christ, which he valued more than the whole world. While he was devoutly assisting at Mass in Barcelona on the feast of the Lord's Nativity, he was suddenly seized by force by an admiring crowd, and in spite of his reluctance, ordained priest by the Bishop Lampidius. Then he returned to Italy, and at Nola, where he had been drawn by devotion to St. Felix, he built a monastery near his tomb, and entered upon the monastic life with some companions. This man, already notable for his senatorial and consular dignity, embraced the folly of the cross to the admiration of almost the whole world, and, clothed in a mean garment, in vigils and in fastings, remained for days and nights fixed in constant contemplation of heavenly things. But, as the fame of his sanctity spread, he was elevated to the see of Nola, and entering upon that pastoral office, he gave a wonderful example of piety, wisdom, and above all, of charity. "God almighty could have made all men equally rich in worldly goods from the very first day of birth, so rich that no one would be dependent upon another. But He did not do it in order to test the hearts of men. He created the poor to make merciful, He created the helpless to put the powerful on trial."